First, let's be clear about what an LMS is. Which components can you expect in an LMS, and which benefits does the modern LMS offer? An LMS's role varies greatly depending on the organization's objectives, core business, and training strategy. You can probably imagine that an educational institution will have a different use for its LMS than a multinational corporation would. There are many different reasons for using an LMS, yet the overall purpose is always the same. Organizations use their LMS to schedule learning events, deliver learning content to learners, administer tests and other assignments and monitor learners' progress. In recent years, LMSs have expanded to include more and more features. It has become indispensable for LMSs to also track and trace learners' progress (often in a learning record store), to be fully responsive (mobile friendly) and to cater to a wide range of hybrid forms of learning, such as blended learning and gamification. 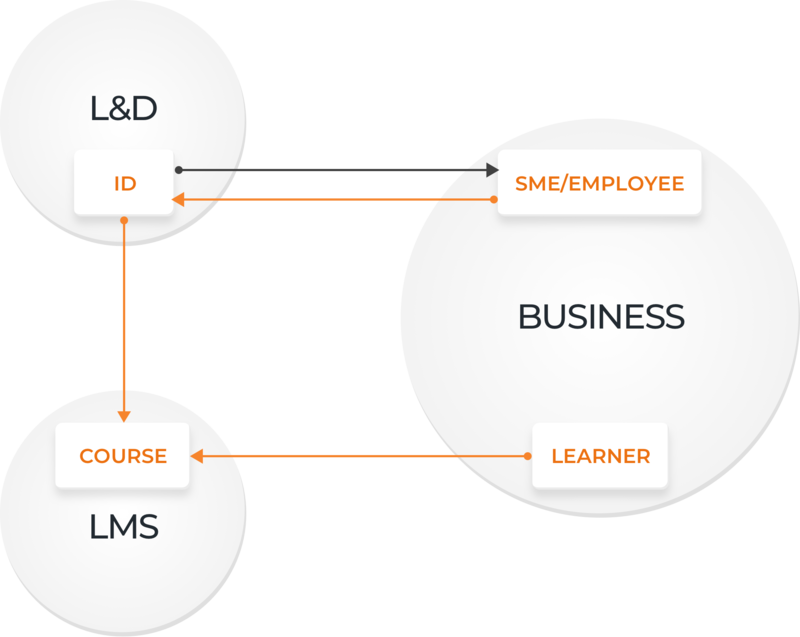 Another trend we see is that LMSs include features that enable users to create their own courses within the system. In other words, LMSs have started to facilitate course-authoring. LMSs clearly offer many benefits. At the same time, there are some clear challenges facing the modern LMS. 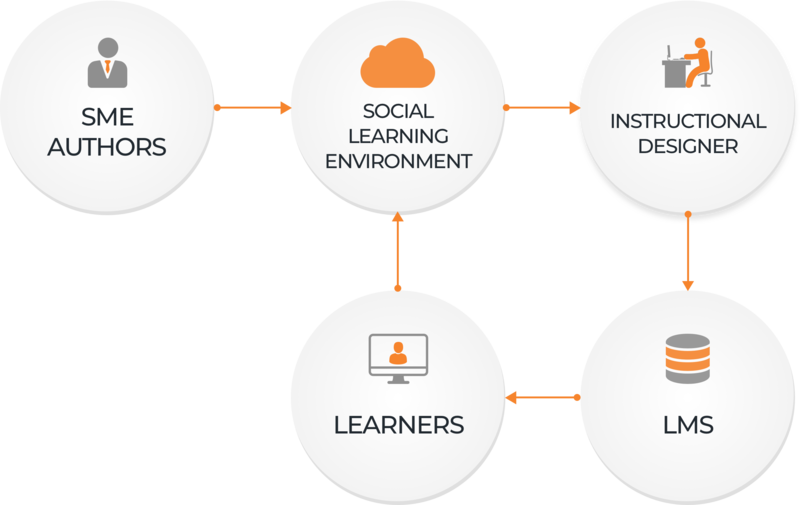 Instant learning: Today's users expect and demand to have access to learning content anytime, anywhere. With many traditional LMSs, the learning process is slow and sticks to an inefficient, top-down learning mentality instead of enabling an instant, bottom-up approach. Personalized learning: LMSs inherently have a standardizing effect on the learning experience. That makes it difficult to account for the personal learning needs and demands of individual learners. Vendor lock-in: LMSs are usually closed, self-contained systems. So, adopting new learning solutions comes with high entry costs because there are few efficient migration tools. Content migration restrictions combined with technical and financial factors can make it difficult for institutions to migrate between different systems. Rise of peer-to-peer sharing solutions: There's a growing trend towards enabling employees who lack a teaching background to create and share learning content. This provides organizations with a learning alternative that challenges the status quo of LMSs. Do you need an LMS if you are starting a new learning program? So, how can you benefit from an LMS while avoiding the pitfalls listed above? We believe that this requires a shift in the way we define what an LMS is or, even better, what an LMS should be. If your current LMS can’t adapt to the new "always-on," user-driven demands of your people, it might be time to look for other options. Interestingly, we see that authoring tools are adopting many of the features of the LMS, and vice versa. It seems that both systems are becoming interwoven into a next-generation learning tool that fulfills the demands of both an LMS and an authoring tool. Who cares if we name it an authoring tool or an LMS? Until quite recently, instructional designers were accustomed to working with labor-intensive tools to create e-learning content. Content had to be created from scratch, and the know-how needed to create it was solely in the hands of instructional designers. Creating an online course was a daunting, tedious process. As a result, costs were high and turnaround times were lengthy. Because of the long creation process, content was often outdated before it was even released. To make matters worse, learning to use these complicated e-learningtools was also time-consuming. Fortunately, things have changed significantly. In recent years, instructional designers have taken on a new role. Instead of creating content-heavy courses for others, they now focus on facilitating instant knowledge-sharing. E-learning content no longer has to be created from scratch using clunky, outdated tools. A variety of innovative, user-friendly tools are now available, including time-saving features like built-in templates that allow content to be reused. These features significantly improve and accelerate L&D and e-learning creation processes. The threshold for e-learning creation is becoming lower and lower. This opens up a wide range of opportunities. Today, anyone can share knowledge instantly, efficiently and inexpensively. The widest-reaching implication is that content creation will now shift from people who specialize in e-learning design to subject matter experts (SMEs). These are the people within an organization who have knowledge of the actual content and can now create e-learning courses about topics in which he or she is an expert. Another major change is the speed and efficiency with which these experts can now create learning content. From a business perspective, e-learning must be cost-effective while still serving its purpose. Not every e-learning course needs to be a tailor-made work of art. An efficient method for achieving fast, cost-effective learning is reusing content and templates. The content can easily be customized as needed, and the design process becomes far less time-consuming. 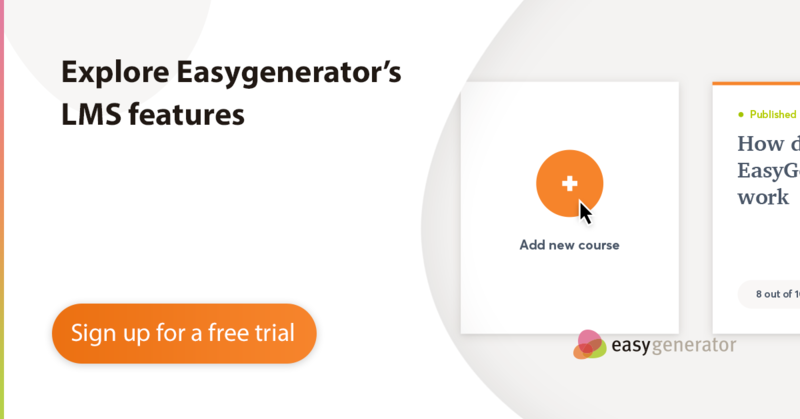 Our own solution, Easygenerator, provides a subject matter expert-friendly authoring tool that enables corporates to implement a bottom-up learning model referred to as Employee-generated Learning (EGL). In this model, any employee can create e-learning content/courses on topics in which he or she is a subject matter expert (SME) and contribute to the training pool. EGL not only solves the common LMS problems of content taking too long and costing too much to create, it also makes it much easier to keep content up to date. Visibility: SMEs gain a confidence boost from being seen by others as an expert. It gives them a sense of pride and accomplishment. Time-savings: SMEs realize they are basically cloning their own wisdom. This extrinsic driver enables teams to work more efficiently and meet the speed of market and business while spending less time repeatedly explaining things. Interested in what our tool looks like? Sign up for free here. Today's organizations must create learning content more quickly than ever before, if they want to keep up with the changes they are facing. Content creation can be greatly accelerated using a learning solution that facilitates reusing templates and content. This also ensures a lower learning curve for creating e-learning content. Simplifying the creation process in this way helps establish Employee-generated Learning (EGL) This approach is cost-effective and allows for easy localization. Employee-generated content is derived from the expertise of an employee, which can be created in a variety of forms, including courses, job aids, help docs, videos, PDFs, how-to's etc. In today's rising BYOD culture, it is also vital for L&D to support mobile learning and equip employees with so-called micro-content which is available to them at the right time and place as they do their work. This approach is known as "microlearning," in which easily digestible pieces of learning content are designed for support and training in real time. Mobile devices are a great tool for supplying these small nuggets of learning content. We recommend choosing a responsive, cloud-based authoring tool. Importantly, the tool should allow instant knowledge sharing and facilitate the creation of learning paths that provide e-learning nuggets. Combining such a tool with a cohesive learning strategy that encompasses the trends described above helps optimize learning processes inside any organization. Instead of traditional learning management systems and authoring tools, we see tools appearing that combine the features of both systems. Learning technologies and tools must be built to support these changing needs and behaviors. We recommend combining next-generation tools with an Employee-generated Learning strategy because enabling employees to create their own learning content is the way forward.